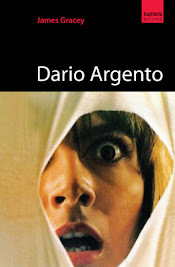 I recently had the pleasure of interviewing Sean Keller - co-writer of Dario Argento's forthcoming thriller, Giallo. The film stars Adrien Brody as an eccentric detective hired by air-stewardess Emmanuelle Seigner to track down her sister (Elsa Pataky), who has been abducted by a crazed psychopath known as Yellow. Yellow is obsessed with mutilating and destroying beautiful things... Will they find her in time to save her life and put a stop to Yellow's devious plans? 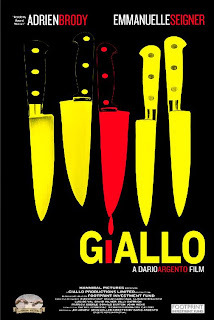 Find out later this year when Giallo is released. The film premieres at the Edinburgh International Film Festival in June. After the death of their father, the three Merrye siblings Virginia (Jill Banner), Elizabeth (Beverly Washburn) and Ralph (Sid Haig) find themselves in the care of their ailing butler Bruno (Lon Chaney Jnr.). Bogart-like crook Renzo Capetto (Antony Carbone) seizes the opportunity to get his hands on some dosh when Cuba has a revolution. He agrees to help General Tostada and a group of exiled Cuban nationals escape on his boat with a sizeable portion of the Cuban treasury. 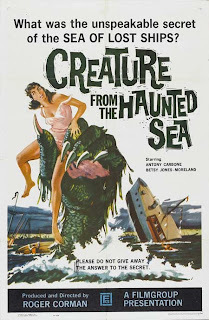 He then plots to kill the men and blame their deaths on a legendary sea monster. So far, so good. Capetto is joined by his faithful, if rather dim-witted motley crew: gangsters’ moll Mary-Belle Monahan (Betsy Jones-Moreland), her woefully inept and highly unhinged brother Happy Jack (Robert Bean), small-time hoodlum and animal impersonator extraordinaire Pete Peterson Jnr. (Beach Dickerson) and ‘mysterious’ deckhand Sparks Moran, who is actually an undercover secret agent (Robert Towne). If you, like me, are watching the pennies, relying on the kindness of strangers, or just in search of a great bargain - why not head over to Paracinema and pick up their premiere issue - for only $5! Go on, you know you want to, you saucy minx. 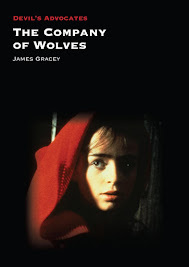 Included in issue 1 is: Into The Green Inferno: Italian Cannibal Films by Tim McLean, Sound And Sountrack: Diegetic Thrills & Chills In Session 9 by Matthew Monagle, Jeffrey's Strange Discovery: Gender, Sexual And Parental Roles In David Lynch's Blue Velvet by Dan Burns and much MUCH more. A small German village is plagued by a number of mysterious deaths, all of which leave the victims drained of blood. 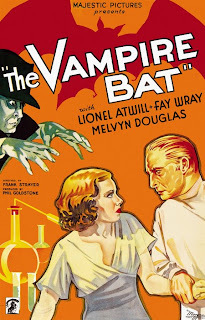 The town elders suspect the work of vampires and a number of large vampire bats are spotted in the area. Sceptical Police Inspector Karl Brettschneider (Melvyn Douglas) suspects the work of a psychotic serial killer who needs the blood drained from his victims for some sort of bizarre experiment… Is he right? Well, he’s not wrong.